Our hosts Life With Dogs, Two Little Cavaliers, and Confessions of the Plume have now brought us 25 weeks of the Blog Hop! It’s a rainy weekend here in our sector of the vast midwestern wasteland, so we are glad to have a lot of good blogs to read for our time indoors. Our hosts Life With Dogs, Two Little Cavaliers, and Confessions of the Plume bring us into Week 24 of the Blog Hop as we approach Halloween! Quite a few pet bloggers are preparing for Halloween festivities, and I’m envious of those of you whose dogs don’t mind wearing stuff, and enjoying the photos. We’re not that creative here, plus the canine members of the team are not so tolerant of clothing. So Freya and Axel are going to be…. 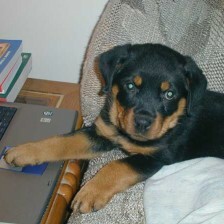 Rottweilers. Boo!